I was walking around Barnes and Noble chain in Orange County when I found a book, a graphic novel that I had been looking for for a long time. I read the entire comicbook/novel in the store. The pages I wanted to buy it for my collection, but I had other things in mind to get at that time. The anticipation for Zack Snyder's take on Frank Miller's amazing graphic novel is almost as unexpected as it was great.Once people got a glipse of the film's trailer, it was immediately added to everyone's to-watch list. 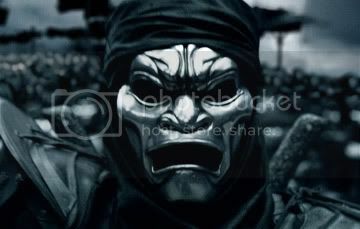 Sparta was not a very popular civilization and it's legend was buried in time and ignorance and was only brought to live by a rubber sandal company. Zack Snyder is not a very popular director, not yet at least. So what was the attraction? The movie is so stylized and well, it just looked great on film! Sparta is in the verge of change. the great nation of Persia has conquered most of the worrld and has amassed their armies and has turned into an unstoppable force. 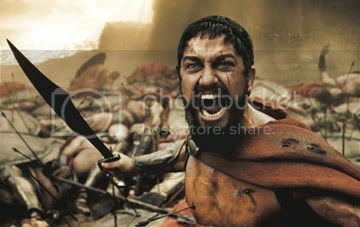 Leonidas(Gerard Butler)is the King of Sparta. A warrior by birth and trade. His heart cannot take surrender. 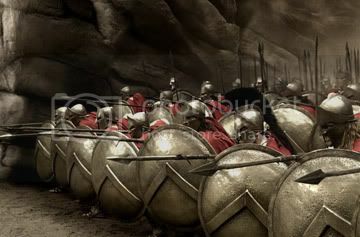 With an army of only 300 dedicated and well trained Spartan soldiers, he bravely faces destiny and marches into the glory of his great nation and people. If awesomeness had an odor, my clothes would have reeked for days. Blood spatters frozen in mid air, mangled bodies gray with decomposition, ripped hard bodies, skies blackened by millions flying arrows. This movie is so full of the cool stuff that blinking is almost a burden. You'd think that given the ingredients above that this would be more of a guy film. Not so my friend. There were an equal number of chicks in the sold out theater I was in in Glorietta 4 as there were guys. In the Tonight Show with Jay Leno last week. Gerard Butler was greeted with hysterical shrieks from ladies in the audience. The Spartans and their hard rocking bodies, especially Leonidas, were medeival eye candy for the honeys. Having read the graphic novel, it was obvious that the goal was to get it as near as possible to the source material. Like in Frank Miller's Sin City. The director played it shot by shot, rendering the page to screen treatment as close as physically possible. And boy did they get it close. After all is said and done, critics will always resort to whether the story is of any merit. Actually I didn't care at this point if the story or dialogue sucked, because it was so visually satisfying. However, simple as the story was, it was delivered with such verve and passion that it kind of gave me the LOTR fuzzies all over again. With David Wenham (LoTR's Faramir) as Dilios the loyal messenger in the cast, the movie brought out the message in the story any respectable filmmaker would want to convey. This is the perfect movie to go to with a loved one, with your no good friends or by yourself. Man, treat yourself to this piece of cinema that will surely be a classic! Now it's time to hit the gym! haha! those 300 great bodies inspired me to do double time sa gym as well. haha! if not for the brands sin city and frank miller, i dont think the movie will have that much hype. i can't stop talking about this movie as soon as ron and i went out of the theater. as in! wala akong masabi. one of the best movies. i love the violence. hehe. oh, that was me, rocketboy.